Notting Hill isn’t just an ordinary district of London. 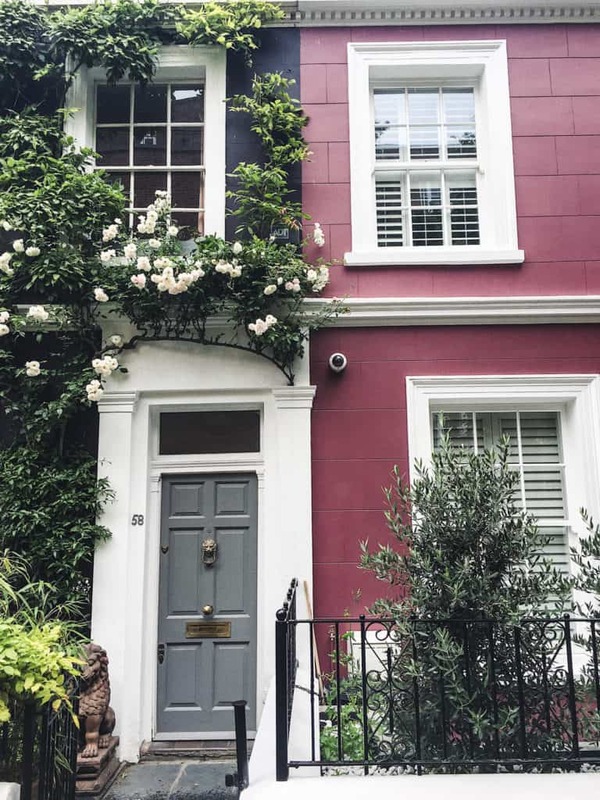 This lovely, vibrant and colourful neighbourhood is also extremely photogenic and attracts Londoners and tourists alike. 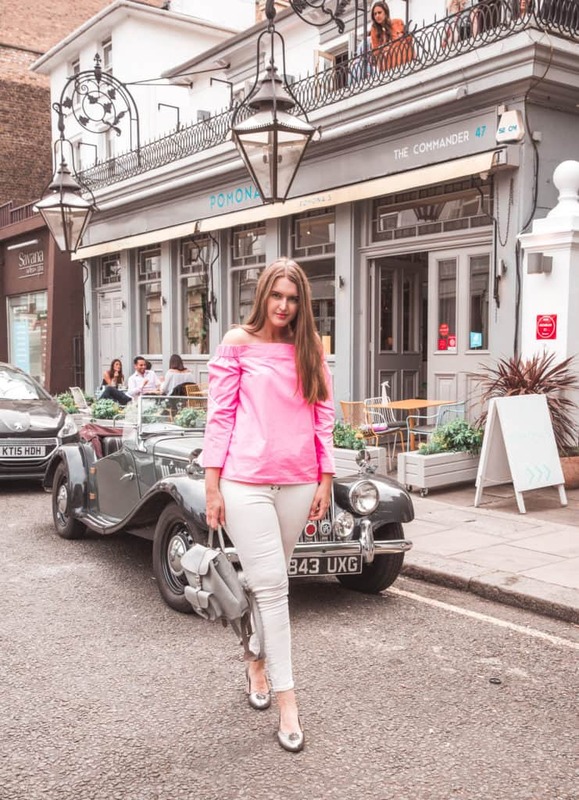 In this post, I’ll take you to a Notting Hill photography walk in London with Bonessi Ballerinas – amazing Italian shoes that look great in real life and photos. If you’re interested in the best Instagrammmable/ photography spots in London: I’ve got a post for you: Instagram Guide to London. 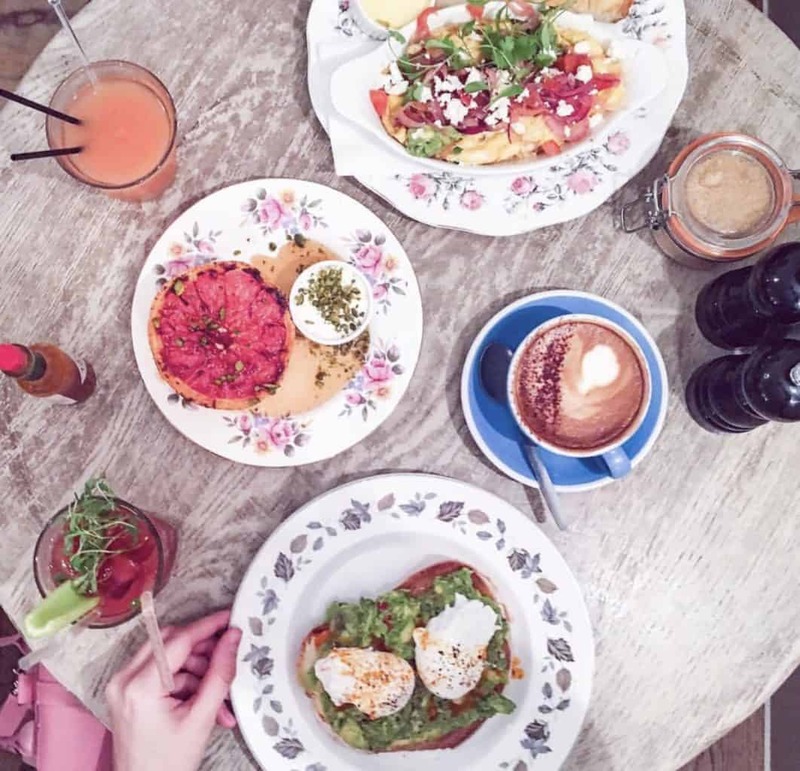 Also, if you’re looking for great brunch spots in London: here’s the guide to the ten best brunch spots in London. Moreover, if you’re foodie that likes Insta-worthy dishes, I’ve got you covered with my recent post about the most photogenic dishes/restaurants in London. First stop of the Notting Hill photo walk is Royal Oak. That’s where we started our small photo shooting with Bonessi Ballerinas. I’ve never been in this part near Notting Hill before, so I was surprised how pretty it was. We were fortunate to find this car parked in front of a photogenic restaurant Pomona’s (47 Hereford Rd, London W2 5AH) and that made it even more unique and picturesque (my shoes from Bonessi Ballerinas are really matching). Then, we headed to the place called Farmacy (74 Westbourne Grove, London W2 5SH) for a gorgeous corner photo. Also, if you go down to Bayswater/ Moscow Rd, there are some really pretty streets that are perfect for taking photos. However, don’t forget to mind people’s private property and do not trespass it / do not take photos on private balconies. Okay, now prepare, because we are going to the most beautiful and photogenic part of Notting Hill. 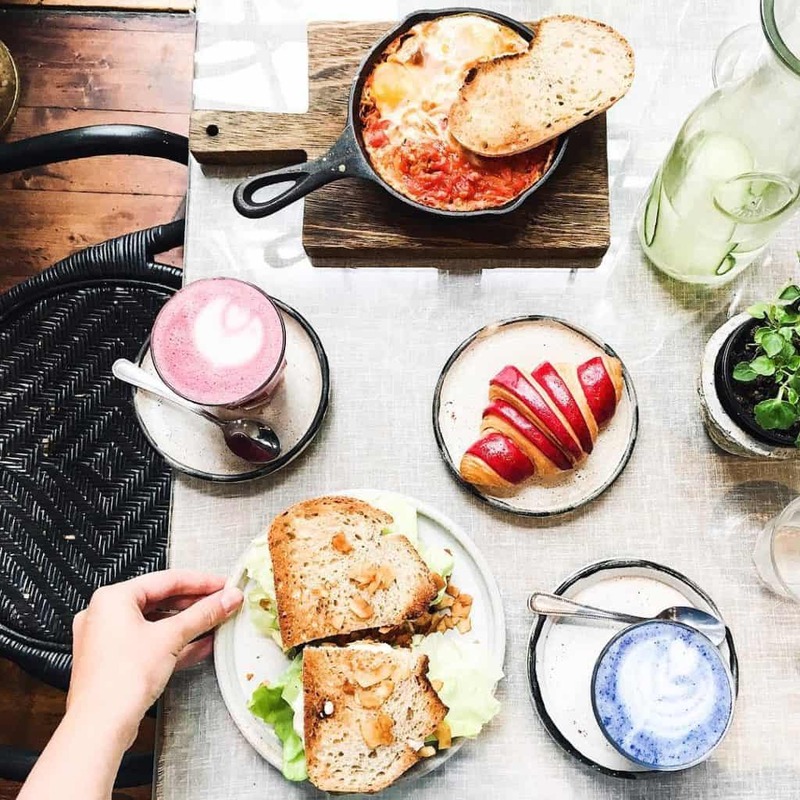 First stop is Eggbreak (30 Uxbridge St, Kensington, London W8 7TA) – a lovely brunch spot that serves breakfast all day long. It’s great for taking photos / flat lays of beautiful food and dishes. After having a brunch, you can head to Hillgate Pl / Kensington place and just walk around looking for the colour of the building you like the most. This is the famous part of Notting Hill with colourful houses that everybody is talking about. If you’re thinking that Notting Hill is small and you need just a couple of hours to see it all, you’re mistaken. 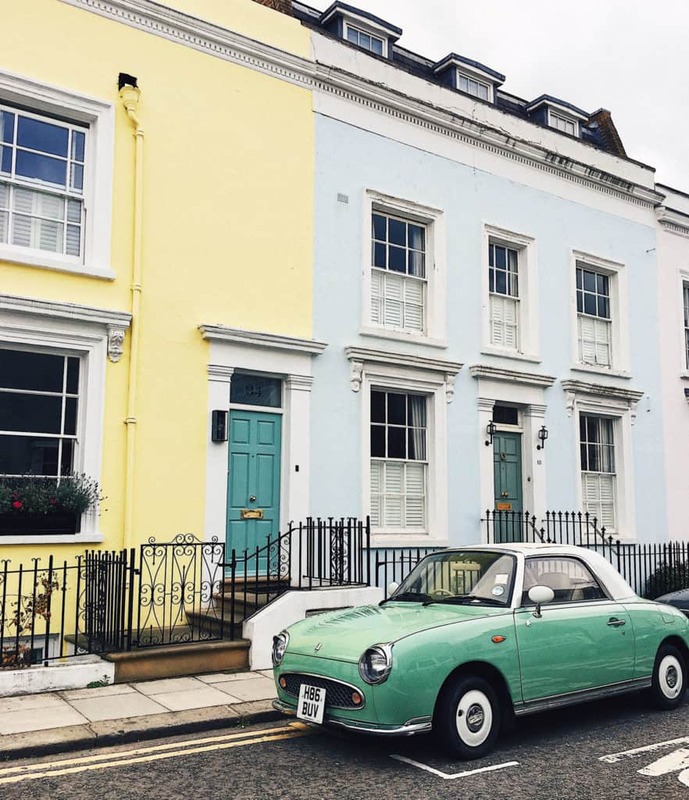 Notting Hill has so many cute streets, cafes and photogenic spots, that you need at least 5 hours to see everything and have a meal in one of the places. In case of the Farm Girl (a trendy brunch place on Portobello Rd), you would need around 6 hours in total, as the queue normally takes 45 minutes to 1 hour (on the weekend, though). One of the most interesting and vibrant places in Notting Hill is Portobello Road. Portobello Rd transforms into a huge market on Sundays and looks pretty different compared to any other day. In the shops of Portobello Rd, you can find everything, from art to antiques. It is also a great spot for photos in Nothing Hill, as it has some of the most iconic places in London. For instance, Alice’s Antiques, 86 Portobello Road that you might have seen if you watched the movie Paddington. The next spot in our Notting Hill photography walk would be Biscuiteers ( 194 Kensington Park Rd) – a black & white boutique & icing cafe that looks great in photos. I don’t know any other city on Earth where living in the former mews would be as desirable as in London. A mews house in Notting Hill would easily cost you over £2,000,000. My favourite mews street in London is probably Pembridge Mews. I don’t have a suitable photo to show you, however, you can believe me, that Pembridge Mews are dreamy (and if you head there, you can see for yourself). That was it about the photography walk in Notting Hill. Hope you enjoyed reading this post. Disclaimer: please note that this post is not sponsored, however, I received a pair of Bonessi Ballerinas as well as several photos of me wearing the shoes from them. All opinions, are, as always, my own.